“Lagosians were terribly discomfitured yesterday (Thursday) with the traffic jam, needlessly, if I must say. There is the need for public officers generally to be more sensitive to the people we serve,” Governor Babatunde Fashola said yesterday. You could say he was speaking the minds of many Lagosians whose lives were severly disrupted during the visit of Patience Jonathan for her ‘peace advocacy tour’. Security operates had put most the state in lockdown with roadblocks in several areas. The Lagos governor made this statement at a retreat organised for members of the State’s Executive Council and Body of Permanent Secretaries. “It is particularly worrisome because this is not an elected person, he continued. “And I think we all, including the security agencies, must know how they pander to our high officers, especially VIP movement, at the risk and expense of citizens and taxpayers whose money was used to fuel all the vehicles that we used to block the roads against those who pay those money. The traffic jam, which lasted several hours, particularly affected several areas on the Lagos Island, Ikoyi and Victoria Island. Some commuters were forced to talk long walks, while motorists were grounded for up to 5 hours. “It is an issue that calls for greater sensitivity to the comfort of our citizenry. 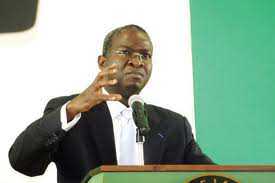 Yes, I understand the need to protect the VIPs, but it must be done in a way that it doesn’t impoverish,” Fashola dug in. “It should not get to the level that we shut down the roads in the state because the VIP wants to pass. If they let us know earlier because going through these roads without shutting them down, traffic can be managed. This is all bitter politics. What was Fashola's security operatives doing when the federal security agents were shutting down the roads. Why did they not offer help? Please Fashola should stop exposing himself & deal with his security agents. We still shut gates at 8PM in Lagos depite the rule to keep them open till 12 midnight. When Fashola provides improved security in Lagos, then he can have the mouth to conderm whoever he wants. Is it because non of his relatives have been killed in the North? It is a sign of disrespect to thoes that have died & the presidency. This is poor governance on his part. Someone blocks d road for 5hrs al in d name of a speech and u say we shd sacrifice. Well let patience go to jos, kD or maiduguri for her peace speech, that is where it is needed. D south west is perfectly fine without d need for some incomprenhensible grammar. @Kenny.Your ending remarks about the first lady was wicked*.Just forget it,It's in our past now.It's good that the governor had something to say about it. Blame Jonathan and not the devil "paytche"(in your words) because they gave her the securities and ORDERED the shutdown of the aforementioned areas in lagos. One would have been tempted to request that Gov. Fasahola ignores patience "the devil" jonathan with the excuse that afterall she's an illitrate while Gov. Fashola is a "deserved" SAN, so their thinking can never be thesame. However, there's always the need to teach and lecture the illitrate atimes, we could call it adult education. And don't let us forget that patience "devil" jonathan is not even a public official, she was never voted or appointed into any public office, she's just a good for nothing kitchen/bedroom/child bearing/rearing staff of an animal care-giver. If I sacrifice just 5hr to show solidarity to the seeming anarchy and unwarranted killings of fellow nigerians so be it. Pls brethren those people killed every day are humans,show some support to bring an end to these evil rather than playing down every effort people are garnering just because of selfish political squabbles.God bless Nigeria! Peace advocacy tour @ a hotel in Lagos while many were killed and maimed just last weekend in Kaduna! If u'ld block the road to bring peace tidings, shldnt it be the roads in Kaduna, Maiduguri, Jos and all the volatile areas in the country? Your tour to them might just convince them to lay down arms and embrace harmonious living rather than frustrate the lives of peaceful lagosians who just want to make a living!